On a brand new venue hastily re-arranged within four days, the Lune CC put on a great series of races. 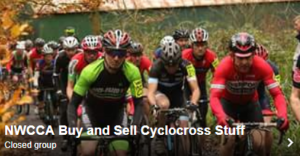 On a short but technical senior circuit, Dave Haygarth (Wheelbase / Gore Bike Wear) enjoyed a realtively trouble-free victory over John Shaw (Ace RT / Impsport) and the unlucky Dave Brailsford (Horwich CC). After a fast start, a broken saddle rail forced Haygarth into an early bike change, letting Brailsford up to join him, but it was Brailsford’s turn for bad luck, with the first of two punctures a lap later. Shaw was the first veteran and Joe Allen took his second junior victory of the weekend. 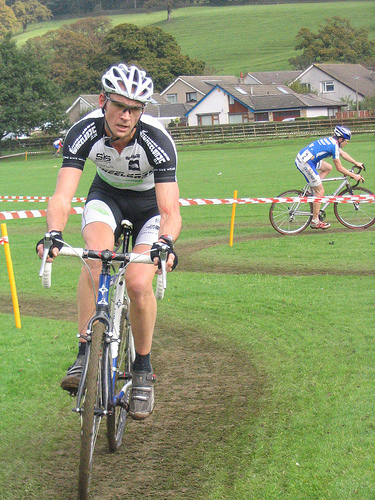 The Wheelbase rider was pleased to be back on the bike after organising the previous day’s cyclocross in Radcliffe. “It’s a tiring business and a very long day organising the race” said Dave, “but I knew I’d have fresh legs today and I was determined to make the most of it – my wife, daughter, mum and my mother in law were watching today – my family home’s just up the road in Kirkby Lonsdale – so I couldn’t afford to mess up!“. In the youth race, Martin Woffindin made the most of the fast but slimey grass conditions and dismounts to take a well deserved Victory. Sam Turton made it two in two days with an impressive victory in the U12s race.